In a series of Twitter posts, Trump also accused the Federal Bureau of Investigation and the Department of Justice of misleading the courts during a probe of Russian interference in the election, but did not elaborate. The FBI documents released on Saturday showed how in 2016 the bureau requested surveillance of the former Trump campaign adviser, Carter Page, as part of that investigation, saying the bureau believed he had been collaborating with the Russian government. A White House spokeswoman referred questions on why Trump believed the documents proved the FBI and DOJ demonstrated illegal conduct or were misleading courts to Trump’s personal counsel. His lawyer, Rudy Giuliani, did not respond to a request for comment. The DOJ did not immediately respond to requests to comment on Trump’s allegation. The FBI declined to comment. Page told CNN on Sunday he was never an agent of a foreign power, and that the documents overstated his ties to Russia. Page could not immediately be reached for comment by Reuters. Trump has repeatedly criticized U.S. law enforcement agencies that are investigating allegations of Russian meddling in the vote, and he has insisted there was no collusion with members of his campaign. Russia denies any interference. 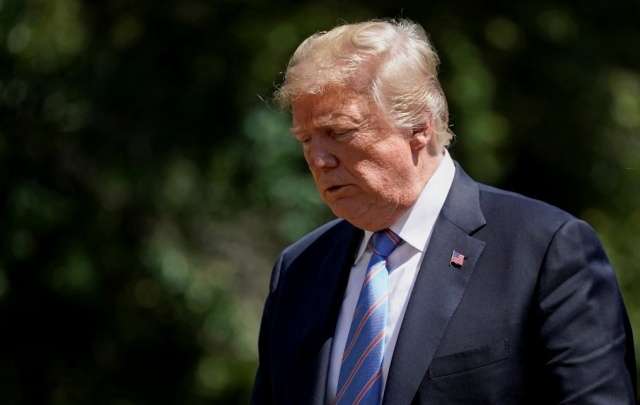 Trump’s statements on Twitter followed sharp criticism, including from some Republicans, of his meeting in Finland last week with Russian President Vladimir Putin. At a joint news conference, Trump failed to confront the Russian leader over Moscow’s alleged election interference and appeared to side with the Kremlin over U.S. intelligence agencies. The 412 pages of heavily redacted documents released on Saturday by the FBI included surveillance applications to the Foreign Intelligence Surveillance Court and warrants surrounding the investigation into Page. They included an initial application and requests for renewals that were filed in 2017, after Trump took office. “The FBI believes that Page has been collaborating and conspiring with the Russian Government,” the surveillance application filed in October 2016 said. Some Republican lawmakers have contended that the FBI made serious missteps when it sought a warrant to monitor Page in October 2016 shortly after he left the Trump campaign. On CNN’s “State of the Union” on Sunday, Page called the documents a “complete joke” and insisted they overstated his relationships with the Russian government.